Walking through the collections, one is brought up short by an excited Diane Erwin. Have you seen this cool leaf? she asks, holding up a fossil leaf specimen with evidence of insect munching. A little later, you spend an hour at the Museums weekly Fossil Coffee (informal presentations on topics of interest accompanied by coffee, munchies, and conversation) to learn firsthand about new research from within the UCMP community or from visiting colleagues. Afterwards, you leave the office and skirt the crowd of new students and interested visitors listening to their guide as he describes the T. rex mount in the atrium. All three of these events are examples of sharing our science, which essentially is UCMPs missionto investigate and promote the understanding of the history of life and the diversity of the Earths biota through research and education. The three cited examples are obviously limited in audience impact. 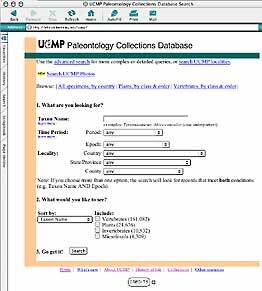 Where UCMP has made its greatest strides in sharing its science with a broad audience is through the Museum website. In this and the next issue of UCMP News, we will highlight some of the new projects that we hope you will explore. This issue highlights our new on-line collections catalog (home page shown below) and shows the global reach of our Explorations Through Time project (see Web notes).